Two of the most popular cooking techniques for the back patio and arguably the most satisfying are rapid searing and, low and slow smoking. Both are great methods to savory spring time grilling. Let’s take a minute to discuss these options. The Art of Searing: One of the most essential cooking techniques worth discovering and learning how to achieve is searing meat. Also one of the simplest ways to get the most flavor out of a premium cut. Searing occurs over high temperatures of dry heat resulting in a delicious brown crust with an improved meaty flavor. It often creates a desirable contrast between the crusted exterior and a tender center. The Art of Searing: One of the most essential cooking techniques worth discovering and learning how to achieve is searing meat. Also one of the simplest ways to get the most flavor out of a premium cut. Discover the art of smoking and searing. See how February 29th. The Art of Smoking: Premium hardwood is key to the low and slow. It adds flavors that can’t quite be experienced in any other way. Those natural, smoky flavors bring out special tastes favored by many. From brisket to pulled pork or chicken, these meats will absorb the smoky flavors as they cook. While typically taking longer periods of time, it is usually done in a more humid environment so the meat does not dry out. It also breaks down connective tissue for fall of the bone barbecue. While the flavors in either method differ, both searing and smoking pique our senses with a satisfying aroma and visual appeal. But what if you could combine the best of both worlds? 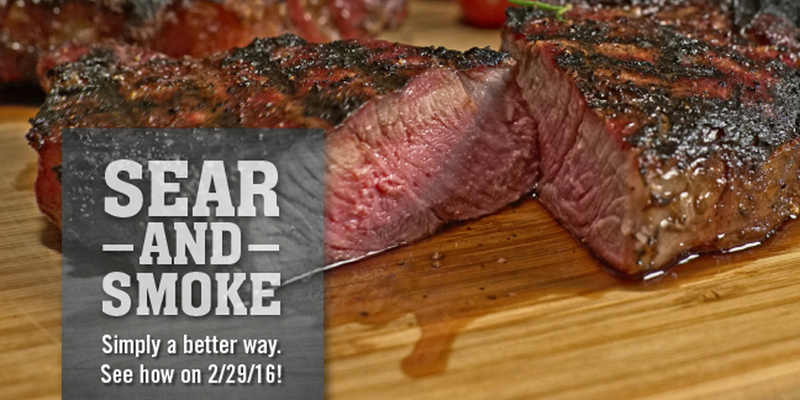 Discover the art of smoking and searing. See how February 29th.